Imagine you’ve been working as an accounting clerk or on an assembly line or in a textile factory for the past 20 years. You’re great at your job and you’ve honed your craft skills over the years. Lately you’ve been seeing signs of change, noticing colleagues shifting roles, and reading increased news coverage of automation. What are your options? Work harder, longer hours, faster? Start looking for new roles? Develop new skills? Where to start? Where to find the time and funds with limited savings and demands from kids and aging parents? What if you had access to a lifelong learning account linked to a self-assessment to identify your in-demand skills, a path to relevant courses for you, and access to a mid-career apprenticeship that would build on your strengths and position you for automation resilient work? Our new report Inclusive Future of Work: A Call to Action tackles these questions head on. We aim to shift the debate from measuring the size of the problem to inviting an ecosystem – across the private, public, and nonprofit sectors – to join us in learning from and collaborating with pioneering organizations on the front lines of ‘new skilling’ workers in more routine roles who face a double disadvantage in the transition to the digital economy. And to do so proactively today – before the point of crisis. It’s well documented that intelligent technologies such as analytics, big data, artificial intelligence (AI) and robotics, are rapidly reshaping work and redefining skills gaps across industries and geographies. Everyone will be impacted, but we find that the impact will not be evenly distributed. New skilling: We refer to ‘new skilling’ instead of reskilling since we view skill building as additive – providing workers with new skills to supplement their existing expertise, rather than discredit or discount what has already been learned. Routine roles: We talk about routine or less complex roles rather than the common term of low to middle skill roles because we find that the latter can stigmatize workers without pinpointing the core issue. Double disadvantage: We posit a double disadvantage since workers in routine roles – who are most likely to be affected by the automation of some of their tasks – are also very likely to struggle to navigate the career and skilling transitions ahead. This is because these same workers typically have not progressed beyond high school or vocational training, have larger skills gaps, limited financial safety nets, lower job security, and less access to on-the-job training than workers in more complex roles. 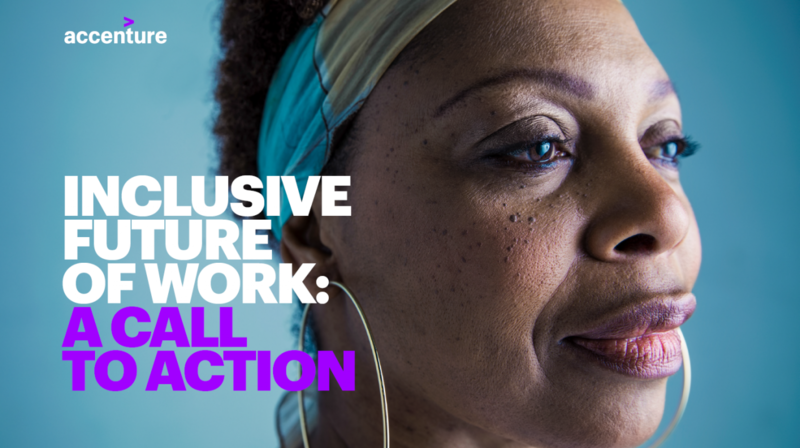 Inclusive Future of Work: A Call to Action takes a worker-centric approach to create a practical blueprint for a more inclusive future of work. Our research combines data and design – analysis of workforce surveys with more than 14,000 workers and 1,200 employers across 24 countries, ethnographic conversations with 60 workers, 30 expert interviews, and economic modeling of employment data from National Statistics Offices, ILO, OECD and O*Net. 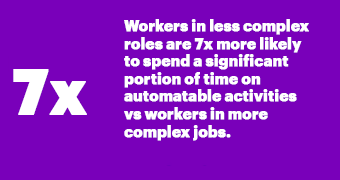 We find that 57% of workers in more routine roles – requiring only primary or secondary education – spend a significant portion of their time on automatable tasks, versus only 8% of workers in more complex roles. On the other hand, workers in more complex roles are likely to spend most of their time on augmentable tasks – which means their roles will change and adapt to use new technologies as described extensively in Man + Machine: Reimagining Work in the Age of AI by Accenture’s Paul Daugherty and James Wilson. While we focus on 7 countries (Brazil, France, Germany, Japan, South Africa, US and UK), we see the same phenomenon showing up increasingly in workforces and economies around the world. What drives the main differences by country is the speed of adoption of advanced technologies which is, in turn, influenced by factors like cultural norms, local laws, and cost of labor. Embrace lifelong learning: Formal learning has not necessarily been a positive experience for this cohort and is not expected to be enjoyed throughout a lifetime. It’s time to evolve the mindset that learning happens from K-12 plus college to embrace lifelong learning. Open lens to future-focus: Mid-career workers are often ‘present focused’ – hesitant to rock the boat for fear of ending up in new lower paying roles with less seniority. Value existing strengths: Workers who’ve been in the same roles for 10+ years often struggle to self-identify their transferable skills – particularly using the language of active recruiters. An in-store worker may say she has retail skills rather than customer service skills which could be highly marketable. Believe in art of the possible: Moving into new roles requires the confidence to believe I’ll be able to make the transition and that it’s worth it. This requires resilience and the ability to let go of old professional identities and to take on new ones. Our blueprint for an inclusive future of work is made up of four sets of workforce interventions, what we call solution spaces, designed to envision new career pathways, expand access to relevant learning inside and outside of work, experience new roles to build work history and put new skills into practice, and empower people to pursue lifelong learning and growth through mutual support, mentorship, and peer-to-peer learning. Throughout the report and in our launch webcast, we highlight global pioneers who leading the way across all four solution spaces by testing innovative solutions. See Singapore’s SkillsFuture credit starting at age 25 with S$500 to take personal ownership for skills development and lifelong learning. And the French government’s activity accounts (‘mon compte activité’) that start with a self-assessment, tools to build an enhanced CV, and links to targeted training and experience. 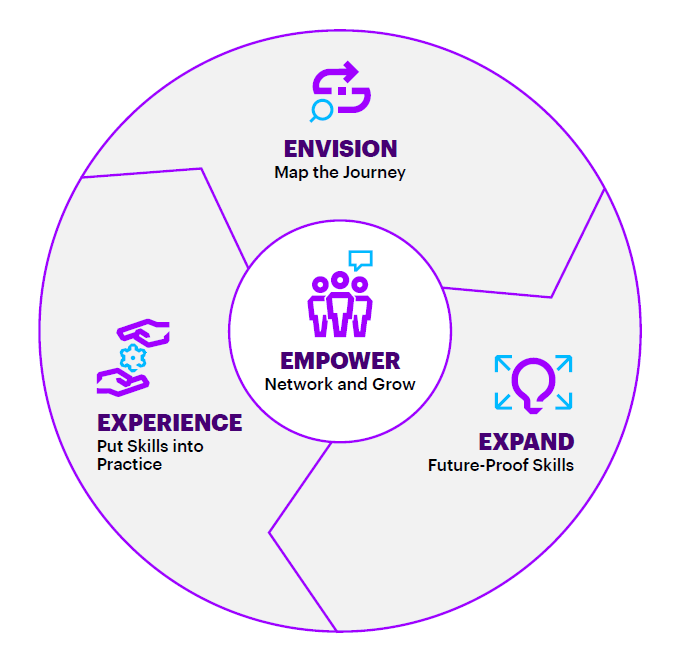 For Accenture and our ecosystem, this is a call to action. Over the coming months, we will be activating workforce development organizations across sectors, funders and clients to design, develop and pilot solutions with us in the US and UK. These pilots will serve as laboratories to test our new skilling framework. By establishing creative collaborations, testing new approaches and sharing best practices, we hope to take concrete steps to build a more inclusive future of work. Join us.